Exquisite Newly Reno'd 2 + 1 Bdrm Bnglow W/ Separate Entrnc & 2 Kitchns In Poplr Highly Rentable East Toronto Neighbrhd, Close To Pub. Trnst, Ttc, Subwy, Parks, Schools, Univrsity, Hspital, Commnity Cntre, Shoppng, Arts Cntrs, Maj. Rds & Hwys, Etc. Hrdwd Flooring Throughout, Upgrded All White Kitchn W/ Ss Appliances, Range Hood, Bcksplsh, Pt Lights, And Crwn Mouldng. 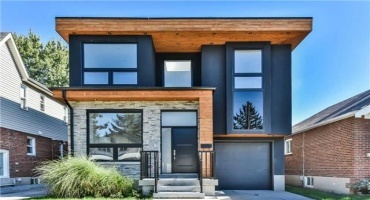 This Is It, A Spectacular & Functional Total Reno By The Beaches, Complete W/Permits. Beautiful Open Concept Main Floor W/ Added Powder Room. Gorgeous Modern Kitchen, Quartz Counters, S/S Appliances, Recessed Lighting & Crown Moulding With Soaring Ceilings On Main. Master Bedroom Boasts 4 Pc Ensuite. Additional Den/Office Space In 3rd Br. Hardwood Floors Throughout Main & 2nd. Beautiful Detached Family Home In A Desirable Location. Sun Filled, 9' Ceiling Modern Open Concept Living Room With Hardwood Floors. Spacious, Beautiful Backyard. Excellent Schools (French Immersion School 500 Meters Away, International Baccalaureate School Only 20 Minutes Walking) Steps To Woodbine Subway, Shops And Taylor Creek Park/Trails. Large Luxury Masterpiece On One Of East York's Most Prestigious Streets. Bright & Spacious Two Bedroom Suite With A Large Balcony. New Kitchen With Backsplash. Renovated Bathroom With Large Stand-Up Shower, Handicap Accessible. Good Sized Bedrooms With Ample Storage. Conveniently Located Close To T.T.C., Schools & Shopping. Amazing Danforth Village Detached Family Home And/Or Investment Opportunity. Totally Renovated 3-Storey Can Be Configured As A 3 Unit Income Property With Dr/Bdrm And/Or In-Law Apartment. Steps From Danforth (Greektown),1 Minute Walking Distanceto Pape Subway, Shopping, Restaurants, Parks, Close To Dvp And Downtown. Mutual Drive With Garage. Welcome To The Finest Parkview Hills Has To Offer! This Modern-Design Beauty Offers Gorgeous Finishes Thru/Out Including A Huge Stunning Chef's Kitchen W/ Corian Counters & Custom Real Wood Millwork. Two Skylights Add Tons Of Natural Light To Open-Concept Main Floor W/ Soaring Ceilings. Living Rm Combined W/ Family Room Has 4 Walk-Out To Deck. Attention Renovators & Handy People. Earn Sweat Equity With This Amazing Opportunity To Renovate To Your Tastes & Live In The Highly Sought-After Riverdale Neighbourhood. Or Fix & Flip. Many Nearby Houses Are Selling Way Over A Million. Perfect Winter Reno Project For A Spring Move-In. The Exterior Has Been Updated W/Stucco, Siding, Back Desk, Sod, Fencing, Laneway Gate. Stunning Leslieville Semi. Offering A Perfect Blend Of Modern Design & Touches Of Original Elements. Featuring Open-Concept Livg & Dining Rooms, Perfect For Entertaining. Walk Out To A Huge Deck And A Fully Fenced Backyard. Second Level Features 2 Good Sized Bedrooms, 3rd Floor-Cleverly Designed Loft. Sommerside Collection New Development By Louisville Homes. Rare Opportunity In Danforth Village. Georgian Style Boutique Condominium. 2 Bedroom Luxurious Suite Available. Offering Pre Engineered Hardwood Flooring, Stainless Steel Appliance Package Smooth Ceiling Throughout, Ensuite Laundry. Open Concept Design With Quality Craftsmanship. Close To Ttc, Restaurants, Shops And Much More..
Sought After "Upper Beach Estates" Three Level All Brick Semi-Detached On A Private Street. Over 2250 Sq.Ft. Of Updated Living Space, 3 Bedrooms, 2.5 Bathrooms With Large Fenced South Facing Backyard, Deck, Detached Single Car Garage And Professionally Finished Basement.